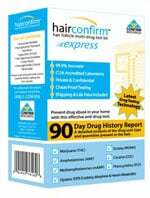 Hair follicle drug testing is one of the most trusted methods of drug testing today and is used by law enforcement officials and organizations alike. It is extremely accurate, providing a drug history for up to 90 days and is proven to be more sensitive than Urine and Saliva testing. 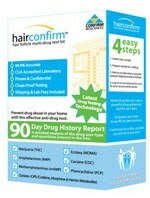 HairConfirm® is the first hair follicle multi-drug test kit designed specifically for parents and individuals, to provide a comprehensive 90 day drug use history report. With a simple at-home hair collection procedure, a hair sample can be taken quickly and easily and mailed to our laboratory using the pre-paid shipping envelope included. 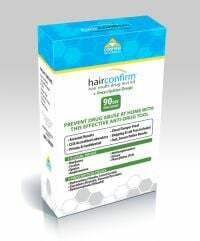 HairConfirm® screens for the five most popular drug classes and is available with regular mail or overnight shipping (HairConfirm® Express). 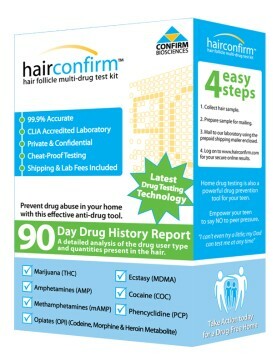 HairConfirm® is 100% confidential;no personal information is required. Each test kit includes a collection kit, complete instructions, pre-paid shipping envelope as well as the laboratory analysis fees. Excellent and accurate product. Was skeptical at first but man was I wrong!!! Shipped fast and got results quick as well which was great! This test is awesome. So easy to use. Four steps and that's it. Results are quick and super easy to understand. Worth the money and puts your mind at ease. Kit was put together well and very strait forward. Looking forward to some good results. Fingers crossed! Good product, clear directions. Results took 1 week to arrive.